At FABTECH, Universal Robots debuted its e-Series line of collaborative robots (cobots), as the UR3e, UR5e and UR10e robot arms boast built-in force/torque sensing, a host of safety features, and improved precision for rapid integration with a range of applications. With a new built-in, tool-centric force/torque sensor, the e-Series can handle cobot applications requiring force control, such as sanding, buffing, polishing and deburring where force-feedback is paramount in order to obtain uniform results. Additionally, the force/torque sensor can measure mass and perform inspection processes or precisely detect contact. 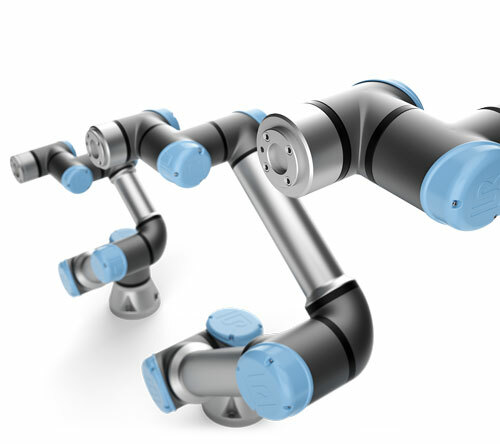 Increased repeatability of 30 microns in the UR3e and UR5e models and 50 microns in the UR10e makes the new cobots suitable for precise finishing, assembly and electronics tasks. Also, redesigned intuitive and responsive touch capability expedites program development by reducing programming to a few clicks on a new lightweight, widescreen teach pendant. At the same time, advanced users can utilize the new, externally accessible 500-Hz system bus to implement more complex motion-control algorithms or profiles, such as advanced machine-vision applications. The user interface also includes the ability to program stopping time and stopping distance for protective stops.